On February 1, 2011, the U.S. Consumer Product Safety Commission in conjunction with Summer Infant Inc, Woonsocket, R.I., issued a warning about a strangulation hazard. 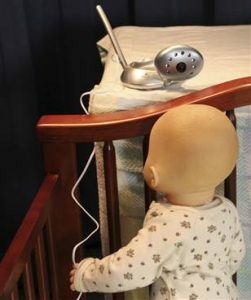 Young babies and children are getting tangled in the cords of video baby monitors and two children have died. There has also been a report made of a child becoming tangled in the cords but had been freed safely. What the CPSC is advising that no cords be within three feet of the crib. If a baby or child can reach the cord it is too close. The report also states that the monitors had been placed on the rail, on the wall and on a dressing table attached to the crib. Summer Infant Inc, has also started a campaign where the company is now putting labels on all of their video monitors. There has been over 1.7 million of these types of monitors sold. We as parents always want to do the best for our children and of course we want to keep an eye on them when they are sleeping. Having a camera in the room is a great way to keep an eye on what is going on. But, on the other hand we do not want to risk having something terrible happen either. By using due diligence with anything that is placed near a baby crib risks will be lowered. Best rule is to never put anything near a baby crib where the child can become entangled. Although there is only one company named in this report there are other brands of baby video monitors on the market. Anything with a cord should never be put near the crib. Do you use this device or anything similar? How far away do you keep the cord?